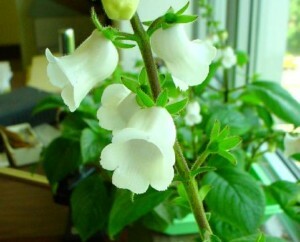 Gloxiniopsis includes one species, G. racemosa (formerly Gloxinia racemosa). Although superficially very similar to Gloxinia perennis, Gloxinopsis racemosa is not closely related to Gloxinia or any other genus in the tribe. The flowers are produced in a raceme like that of G. perennis, but the fruit is more like that of a Monopyle species. The species is found in the Andes of Colombia.